Hi-Finity door ... ‘infinite’ view. AS IT celebrates its 10th anniversary this year, Reynaers Middle East says it has seen exponential growth with the Bahrain office having grown 500 per cent over the past seven years. Over the last couple of years, the aluminium systems specialist has also opened two offices in Egypt and the UAE. “It has been a challenging yet fruitful journey so far,” says Ali Khalaf, the company’s managing director with a glint of excitement in his eyes. Reynaers, the Belgian aluminium systems provider, launched Reynaers Middle East operations in 2004 with the headquarters based in Bahrain and today this office caters to 10 different countries in the region. Starting with only three employees, it today boasts a talented workforce of 45 team members. The staff strength at the Bahrain office has tripled in the past two years, increasing the head count in the technical and logistics departments in an effort to boost the quality of services for the company’s valued stakeholders. “The major milestone achieved last year includes the set-up and deployment of a warehouse in Saudi Arabia catering to two major business units – the existing B2B business (project based) and the upcoming B2C business (home owners based),” says Khalaf. Although predominately known as a project-based market, the Middle East region also has unequivocal potential as a market that caters to end users, comments Khalaf. “The purchasing power of the Saudi customer makes it a highly attractive market to offer superior quality aluminium doors and windows with high technical performances,” he adds. The company has consistently evolved and adhered to its focus on unparalleled research and innovation and the latest Hi-Finity is one such product launched last year which has received glowing reviews for its sleek look and high technical standards. This is the sliding door offering an ‘infinite’ view, which has been specially designed to meet the latest trends in the world of home décor. By integrating the aluminium profiles into the walls, the glass surfaces extend from floor to ceiling, creating the ultimate minimalistic appearance, merging the indoors seamlessly with the outdoors. An added design aspect is given by the handle that has a slim, elegant and streamlined appearance, says Khalaf. “With this handle, large opening surfaces can be easily operated,” he says. Despite the minimal visual sidelines, the system’s high strength allows it to carry the weight of a large glass pane up to 500 kg, he points out. “This, in combination with the high energy performance and the minimalistic look, makes this product the best solution for the low-energy contemporary architecture,” Khalaf adds. Different opening designs include duo rail, three-rail and a central closing option, thus providing solutions for up to six movable glass panes per application. The specially designed wheel base realises a fluid movement of the glass panes, which guarantees that even large openings can be easily manually operated, he says. For an even higher level of comfort, a concealed motor opens the vents fully automatically with the push of a button or on the remote control. Hi-Finity is available in a double and triple-glazed version, creating a high thermal insulating solution, according to Khalaf. This is further enhanced through the system’s air-tightness. The different sealing components create a firm barrier against air intrusion. 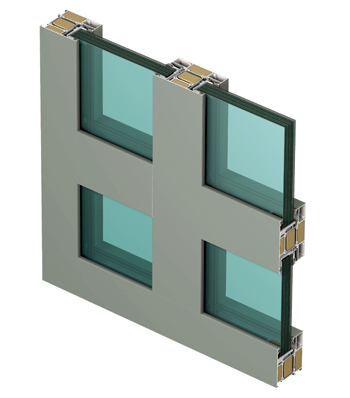 “The sections that provide the connections between glass panes are designed with a Reynaers-patented adjustable profile that guarantees a perfect fit for complete air-tightness,” he says. Furthermore, the concept of the locking mechanism gives the door a high level of security. In combination with layered glass, Hi-Finity is burglary resistant conforming to Class RC2. The electric locking and unlocking is realised by a robust bolt and hook, operated by a simple push on the button or the remote control. Additionally, the luxurious Purity handle enhances the aesthetical features of the special Hi-Finity sliding door as well as those of any of Reynaers systems. Purity handles ... adding value. 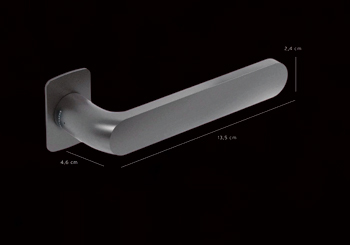 This high-quality handle combines next-generation materials and mechanical properties with the superior Italian design abilities of designer Leo de Carlo, who previously worked in the studios of Philippe Starck. “As for Purity, it’s a unique Reynaers handle series for people who desire the ultimate in design and quality,” says Khalaf. “But Purity is much more than just a great design. The combination of the material and its surface treatment makes the handle non-corrosive, hypoallergenic and 100 per cent recyclable,” he adds. Purity handles are available in three standard colours (Sapphire Black, Moonlight White and Lithium), while five more colours are available on demand (Or, Obsidian, Polaris, Eclipse and Belgian Chocolate). All of Reynaers’ latest products were promoted at The Big 5 2014, the region’s leading building and construction exhibition held in Dubai, UAE, last November. These included the enhanced CS 77-FP system, which combines superior fire-proofing solutions for doors and partitions with a vast design and aesthetic potential and ease of production and installation. “This highly integrated state-of-the-art solution offers two ranges to provide fire resistance for 30 and 60 minutes, both designed for internal and external applications,” says Khalaf. He says the CS 77-FP has been certified by various internationally-recognised laboratories throughout Europe and is fully compliant with EU regulations, achieving EI30 and EI60 classification for fire resistance. Ashrafs Towers ... supplied to by Reynaers. The CS 77-FP doors can be combined with burglar resistance to RC 2 grade, in line with European testing standards EN(V) 1627-1630, and an emergency or panic function to permit users to open locked doors from the inside in case of danger. The CS 77-FP door and partitioning system also accommodates fixed windows, while its extended range of flush doors is available for all inward and outward opening door types. It is designed to accept a full line of door locks and hinges to fit all types of locking requirements, ranging from standard single-point locks to motorised multi-point locks, as well as fully integrated solutions in building management systems. Both single- and double-leaf doors are available up to a maximum door leaf size of 1.3 by 2.75 m, making it possible to design extra-large doors. The system is compatible with most of Reynaers’ gear and stylish Purity design handles. “The CS 77-FP glazed partition walls and fixed window elements are available with heights up to 4.4 m for the EI30 variant and 3.8 m for the EI60, carrying glass sheets of up to 2.1 m wide and 3.5 m high, depending on the classification selected. This allows the architect to create glass walls of practically limitless lengths. 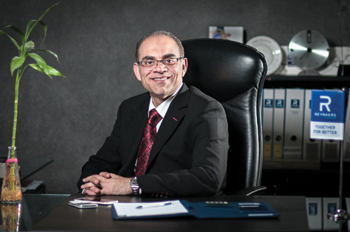 Maximum glass surfaces of 6.85 sq m (EI30) and 4.45 sq m (EI60) can be accommodated,” Khalaf says. Apart from launching new products, last year’s Big 5 saw an important development in the marketing of Reynaers products with its impressive stand displaying full elements of all popular systems allowing various stakeholders including developers, consultants, architects, engineers, contractors and fabricators to experience first hand the products that were installed. The stand was constructed in line those seen at international fairs such as bau in Munich, Germany, or Batimat in Paris, France. Approximately 300 visitors attended Reynaers’ stand with the bulk comprising fabricators and contractors. The CF 77 folding door and the Hi-Finity proved a major draw for their sleek appearance combined with advanced technical performance. The CS 77-FP composite window. Reynaers Middle East now ranks among the leading aluminium systems suppliers in the region. Some of the well-known projects executed in Bahrain alone include Tala Islands, Ruf car showroom, Era Tower, Zain headquarters, Addax Bank, Ministry of Electricity building, Platinum Tower, YBA Kanoo Tower, Al Ayam Publishing building, Euro Tower, RCSI Medical University, Al Salam School and several sports facilities. “Reynaers’ latest accomplishment in Bahrain is yet another stunning structure enhancing the kingdom’s skyline: the Four Seasons Hotel at Bahrain Bay. A bespoke solution was used for this project using the CW 86 unitised/element façade, serving the project’s requirements for a very large spanned façade and thermal-break profiles appropriate for this high-rise tower,” says Khalaf. 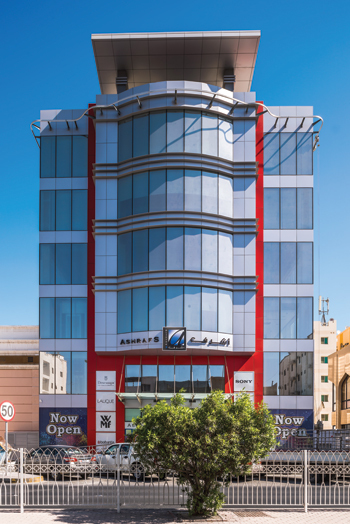 Additionally, several other projects have been undertaken in the Bahrain market, namely the revamped Ashrafs Towers in Hoora, the La Vinoteca Barcelona and Café Amsterdam restaurants in Adliya, modern residential buildings in Amwaj Islands and the Nooh Building in Juffair. Reynaers is a leading European specialist in the development and marketing of innovative and sustainable architectural aluminium solutions for windows, doors, curtain-walling, sliding systems, sun-screening, conservatories, skylights, screens and systems to incorporate blinds and ventilation grids. Established in 1965 and headquartered in Duffel, Belgium, the company has offices in more than 30 countries worldwide. Besides offering an extensive range of standard solutions, the company also develops solutions that are tailored to individual projects.